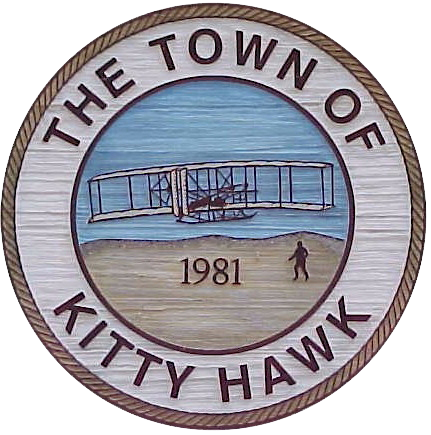 There is a parking lot at the Kitty Hawk Bath House, located at 3840 N Va Dare Trail. There is also a public parking lot and port-o-potty at Byrd Street located just south of the intersection of Kitty Hawk Road and NC 12. Visitors to Kitty Hawk’s beaches are protected by our Ocean Rescue personnel, a division of the Fire Department. Ocean Rescue performs lifeguard and ocean safety duties from Memorial Day until Labor Day, and it works to inform the public on ocean safety year round. There are fixed lifeguard stands at the Byrd Street access, the Eckner Street access, and the Kitty Hawk Bath House access, as well as roving lifeguards on ATV’s. Between Memorial Day and Labor Day, the Ocean Rescue personnel are on duty from 10:00 a.m. until 6:00 p.m. Between Labor Day and September 30, Ocean Rescue Staff will be on duty from 10:00 a.m. to 5:00 p.m. The Town also has a handicap accessible public sound access at Windgrass Circle. It has parking and is open from sunrise to thirty minutes past sunset. It’s important to know what to do if you encounter a rip current! There’s no need to panic; simply understanding what is happening and knowing what to do can save your life. Storms and winds in the open ocean cause waves. Rip currents are generated through wave actions and longshore currents. Sometimes rip currents dig a channel in the sand and force the water back outside the surfline. A rip current is a narrow current which flows outward from the shore. The rip current is characterized by wave action on both sides, a deeper, sometimes choppy appearance in the center, and often muddy cloudy water flowing outward pas the breaking waves. The wave energy creates the longshore current that flows parallel and close to the shore from the direction of the source. Look for the longshore current by the angle of the waves coming into the shore and/or swimmers and surfers flowing parallel to the shore. REMEMBER, the longshore current acts as a “feeder” for dangerous rip currents. If you are caught in a rip current, remember, DO NOT PANIC, and simply swim parallel to shore until you are out of the current. Swimming in the ocean is prohibited when the red “No Swimming” flags are posted. Violation can result in a $250.00 fine. Click here for information about dogs on the beaches of Kitty Hawk.